Mazda has launched its new CX-5, a compact SUV crossover model, priced from €25,195 ex-works for the entry level 2.0 (165bhp ) 2WD Executive petrol version and 2.2D 2WD (150bhp ) Executive model. It is the first Mazda to embody its innovative Skyactiv technology. The CX-5 comes in a choice of two engines - the aforementioned 2.0-litre petrol and 2.2-litre diesel models, plus the option of a 175bhp output for the 2.2D model. And all engines feature i-Stop, Mazda’s stop-start technology. There is also a choice of manual and automatic transmissions, two-wheel drive or all-wheel drive and three specification levels - Executive, Sport and Sport SE. Mazda says it is thanks to its new Skyactiv technology, the Mazda CX-5 is engineered to deliver best in class CO2 emissions of 119g/100kms from the 2.2L diesel engine. This places it in our road tax Band A (€160 ). The new CX-5 also is ahead of the competition in delivering claimed exceptional fuel economy of 61.4mpg (or 4.6L/100kms ) in the case of the front-wheel drive diesel version. Skyactiv also delivers a new chassis, new transmission, and a lightweight body for the CX-5 which, Mazda says, is aimed at the goal of delivering driving enjoyment and performance, inspired by Mazda’s legendary MX-5 roadster. The exterior design and styling of the CX-5 is attractive, as is the interior, which boasts real quality materials and and a well-thought layout. The slightly elevated driver-oriented cockpit layout gives an excellent driving position with all-round good visibility, comfort and access. On the road, the diesel offers a good level of refinement and great performance. The six-speed manual gearbox contributes to a smooth, sharp shift and an unexpected sporty driving experience. The ride is comfortable, but firm, with no roll when cornering, and despite the steering not giving great feedback, the CX-5 drives as good, if not better, as all rivals in this segment. With families as the target market, Mazda engineers ensured the interior deals with the demands of real life. Boot space is a claimed class leading 503-litres, maximised with 4:2:4 split rear seats, while passengers enjoy class leading rear legroom. Mazda says (as do all manufacturers these days ) safety is paramount. And to this end, the CX-5 is the first non-premium SUV in its class to offer smart city brake support that helps prevent low speed frontal collisions, as standard. The CX-5 also features state-of-the-art passive safety structures. Overall, Mazda tells us its goal is no less than top ratings in crash tests around the world. The CX-5 comes with very generous levels of standard specification. The diesel Sport (second level ) model, priced from €29,495 ex-works, features 17” alloy wheels, climate control, cruise control, Bluetooth®, parking sensors with rear camera, and a 5.8” touch screen with Tom-Tom® sat nav. This is the version Mazda Ireland expects to be the top seller. Steve Jelliss, director market support at Mazda Ireland, told the Advertiser: “The new Mazda CX-5 is a hugely important car for the Mazda, marking a renaissance for the brand in Ireland. Skyactiv Technology delivers lower cost motoring to the consumer while still offering the superior level of driving dynamics for which Mazda is renowned. 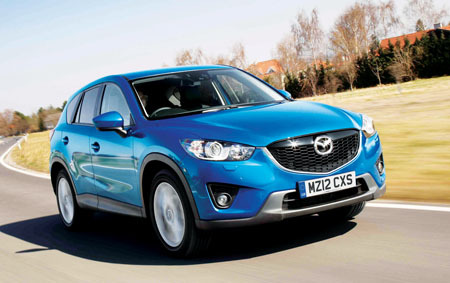 Check out the new Mazda CX-5 if you are in the market for an SUV crossover. It is stylish, spacious, functional, clean, economical, refined, and a performer.